TodoToday is intended to be a minimalist task manager focused on getting things done by showing only the tasks that are due and allowing for basic task entry to capture new tasks. For adding new tasks Nozbe supports a 'Smart Add' syntax to include key task fields in the task entry text. The Project for the task can be included in the task entry using a # prefix, a Context can be indicated using a @ prefix. e.g. "Call John on Monday #Personal @Home !". 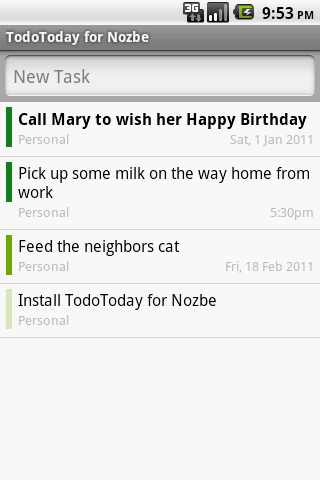 The Task list now shows due and overdue tasks in addition of next actions. Multiple Contexts and Task Comments are now shown in the expanded details. Next actions priority bar is color coded and sorted based on the due date. TodoToday for Nozbe is available as both a free Ad supported release, and a paid 'Pro' Ad free/donation supported release.